Yesterday, over 100,00 people marched in London calling for a 2nd referendum, I popped in to show my solidarity earlier as I needed to be somewhere else but it looked big. I shouldn’t call it a 2nd referendum, its more a case of asking us if whatever they get, is what we meant and still want? And now I discover a reason for staying in Momentum, here’s a petition calling on Momentum to consult its members on the subject of Brexit. We are proud members of Momentum and consistent supporters of Jeremy Corbyn’s leadership of the Labour Party and of the 2017 election manifesto. We deplore the persistent attacks of the right-wing of the Labour Party and their attempts to weaponise the issue of Brexit against our party leadership. But we are equally opposed to the Tory Brexit now on offer. It is a disaster for working class people, public services, peace in Ireland, migrants, the environment, human rights, jobs and our children’s futures – the complete opposite of everything a socialist government would do. The so-called soft Brexit being pushed by neo-liberal “centrists” is hardly better: it threatens to turn us into a vassal state of Europe, making us rule takers not rule makers. 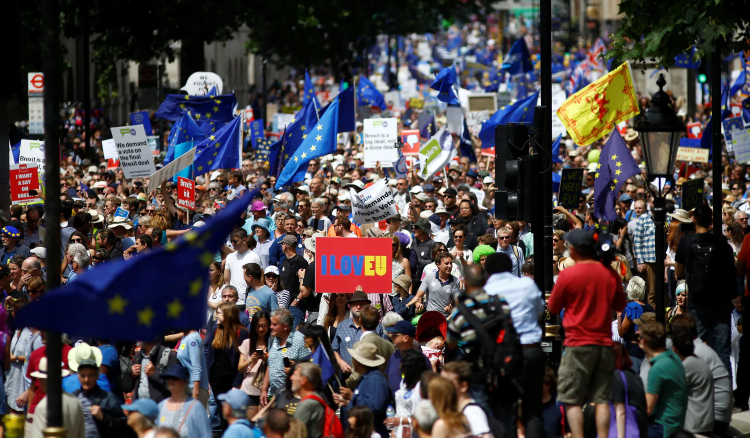 We call for a vote of all Momentum members this summer to decide whether to oppose Tory Brexit, and whether to campaign for Labour to hold a vote at Annual Conference in September on giving the people the final say on the Brexit deal. We are a democratic socialist movement, and under Momentum’s constitution we can trigger a vote of all members with signatures from around 4000 Momentum members – please add your name today, and spread the word! The petition form is also posted below the fold, to see it, Read More ….